The Australian Museum is making a range of specimen information and data from its natural history collections available through the Atlas of Living Australia. Australian Museum Arachnology Collection The Australian Museum Arachnology collection includes arachnids (spiders and their relatives), myriapods (centipedes and millipedes and their relatives), onychophorans (velvet worms), and tardigrades (water bears). The Arachnida represent the largest proportion of the collections, at about 95%. Australian Museum Entomology Collection In the insect (s.l.) collection, there is an emphasis is on the New South Wales fauna, although there are significant holdings from other states and regions. 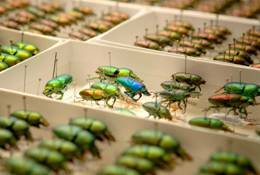 The collection has internationally significant holdings of acalyptrate Diptera, Psocoptera, and Chrysomelidae as well as major Australian collections of Neuroptera, Megaloptera, Lepidoptera, and Coleoptera. Australian Museum Herpetology Collection Two thirds of collection are reptiles, two thirds of which are lizards. Contains collections of most recently extinct eastern Australian frogs. Australian Museum Ichthyology Collection As one would expect, the Fish Research Collection contains many adult and larval fish specimens. These are used by researchers worldwide. Australian Museum Malacology Collection Malacology is the study of the group of animals called molluscs. Molluscs include chitons, clams, mussels, snails, nudibranchs (sea slugs), tusk shells, octopus and squid. Australian Museum Mammalogy Collection The Australian Museum Mammalogy collection is one of the most comprehensive collections of Australasian mammals in the world. While it contains specimens from all over the world the largest collections are from Australia, Papua New Guinea, Indonesia and the Solomon Islands. Australian Museum Ornithology Collection Specimens of rare and extinct Australian and international bird species. Historical Australian collections from 1860s onwards. Australian Museum Palaeontology Collection The Australian Museum palaeontology collection contains some of the Museum's greatest treasures. One of the most spectacular is 'Eric' the opalised pliosaur from Coober Pedy. The collection also contains some of Australia's oldest mammal fossils, collected from the opal fields of Lightning Ridge in northern New South Wales. Click to view records for the Australian Museum.